The CIHEAM attended the 4th Union For Mediterranean (UfM) Ministerial conference on strengthening the role of women in society in Cairo (Egypt). Given the pressing challenges faced by the Mediterranean region, this high-level meeting invited parties to give a new impetus to gender equality and to the respect of the rights of women and girls. Gender equality is mainstreamed through all the activities of the CIHEAM. Social and economic empowerment, education and capacity building, enhancement of women’s role in the field of poverty reduction and in crises prevention are key items of the CIHEAM Action Plan for the Mediterranean (CAPMED 2025) adopted in 2016. The CIHEAM took part in the expert working group meetings on “Women’s Economic Participation & Leadership” and presented the GEMAISA programme to the audience. Financed by the Italian Cooperation and conducted by the CIHEAM-Institute of Bari (Italy), GEMAISA’s objectives are aimed at enhancing gender mainstreaming for sustainable rural development and food security in southern Mediterranean countries. These goals are achieved through an interinstitutional public/private platform to protect and increase the role of women in the Mediterranean and in the Near East mostly in natural resources management and food security through institutional building. Moreover, a specific component is developed through the assessment of strategic potential partnerships for women empowerment with consequent capacity building, dissemination both in national and international scenarios of positive women entrepreneurship experiences in target areas. Long-time committed to the search for solutions to climate change through the development of agricultural best practices, the CIHEAM participates in this Day devoted to the “4 per 1000 initiative: soils for food security and climate” on the occasion of the COP23 in Bonn on the 16 November 2016. During the high-level meeting that brought together several Ministers of Agriculture and Heads of research institutes and international organisations with the presence of Dr Ibrahima Mayaki and Mr Stéphane Le Foll, respectively President and Vice-President of the Initiative, Mr Mohammed Sadiki, Vice-President of the CIHEAM, recalled the strong commitment of the Centre in the struggle against climate change. As in Africa, in the Mediterranean, the struggle against climate change, land degradation or desertification is closely linked to issues related to water, agriculture and food security. Farmers and fishermen are the first victims of climate change and when agriculture is the only means of livelihood, rural people, especially young people, are forced to migrate to cities or other countries. “Migration, climate change, inclusive and sustainable development and security are closely interrelated and must be addressed through a holistic approach” recalled Mr Sadiki. The Strategic Agenda of the CIHEAM, CAPMED 2025 is entirely devoted to connecting economic, environmental and social approaches by supporting farmers and fishermen. The CIHEAM is a place for exchange between experts but also between decision-makers and above all, the CIHEAM is an active Organisation that works with the entire academic community to train young people and find solutions to the region’s challenges. Thus, among many projects, the CIHEAM presented MARSADEV, a project implemented in Egypt in the field of soil rehabilitation by carbon sequestration in oasis systems. For the second consecutive year, the Concert for the Earth, organised by the International Centre for Advanced Mediterranean Agronomic Studies, Institute of Bari (CIHEAM), was held on the 28 October 2017 at the Teatro Petruzzelli in collaboration with the Italian Ministry of Foreign Affairs and Cooperation (FARNESINA) and with the support of the United Nations Food and Agriculture Organization (FAO). With the participation of the President of the Apulia Region, the Mayor of Bari, Rectors of Universities, the CIHEAM Vice-President, Gianni Bonini and the Director of the CIHEAM-Bari Institute, Maurizio Raeli, this event celebrating the WORLD FOOD DAY was related to the theme "Changing the Future of Migration, Investing in Food Security and Rural Development". The FAO Director-General, José Graziano Da Silva, also addressed a video message in which he hailed the partnership between the FAO and CIHEAM and commended the engagement of Cosimo Lacirignola, Secretary General of the CIHEAM “to make our world fairer and safer, especially for young people in the Mediterranean region”. In the margins of the speech made by the FAO Director-General, Graziano da Silva, to the European Parliament's Committee on Agriculture and Rural Development, a bilateral meeting with the Secretary General of the CIHEAM, Cosimo Lacirignola took place in Brussels.This meeting was the occasion to discuss new areas of collaboration on South-South Cooperation to improve rural livelihoods and for the future of food and agriculture in the Mediterranean and Africa. These are main regions faced with major climate change impacts, distress migrations and rural exodus and food security in a context of scarce natural resources. These issues are at the heart of the CIHEAM Action Plan for the Mediterranean (CAPMED2025). Agriculture contributes significantly to Morocco’s economy and employs 40 % of the country’s workforce. However, the sector faces major challenges and important actions need to be taken to make it more sustainable. Working with the private sector to pave the way is key. With this in mind, the International Center for Advanced Mediterranean Agronomic Studies (CIHEAM), the European Bank for Reconstruction and Development (EBRD) and the Food and Agriculture Organization of the United Nations (FAO) organised a forum on sustainable value chains on 20 April 2017, in partnership with the Moroccan Ministry of Agriculture, Fisheries, Rural Development, Water and Forests. The forum gathered participants from all segments of the value chain – agribusinesses, producers’ associations, financial institutions – to examine opportunities for improving the economic, social and environmental sustainability of Morocco’s agrifood sector. A round table was held at the "Salon International de l’Agriculture" in Paris, on the 28 of February 2017, on the occasion of the launch of the 38th Watch Letter of the CIHEAM published with Agreenium and that provides a Mediterranean overview of rural and digital innovations at work. The discussions enabled to identify levers for actions and perspectives in this region that is faced with several challenges such as producing more (due to demographic growth) with less due to the scarcity of resources and better with regards to environmental and social requirements especially in rural territories that are sometimes fragile. On the 20 of February 2017 the Euro-Mediterranean meeting “Enhancing international cooperation in the field of Mediterranean agriculture” was held in Bari (Italy) with the participation of Phil Hogan, EU Commissioner for Agriculture and Rural Development, the Ministers of Agriculture Roderick Galdes (Malta), current President of the European Agriculture Ministers’ Council, Edmond Panariti (Albania); and the delegations of Italy, Algeria, Egypt, Lebanon. As the European Commission is developing new programmes and partnerships in the areas of food and nutrition security, rural development, youth employment and migration issues, the meeting focused on the necessary enhancement of international cooperation in agriculture in the Mediterranean region. The UNFAO-CIHEAM joint edition of Mediterra entitled « Zero waste for the Mediterranean: Natural resources, Food and Knowledge » was launched in Rome on the 5 of December 2016, by the UNFAO Director General, Mr José Graziano da Silva and the Secretary General of CIHEAM, Mr. Cosimo Lacirignola, during a side-event of the FAO Council 155th Session, bringing together international experts and representatives from across the world. On the 24 January 2017, a debate entitled, "Zero Waste of Human and Natural Resources: an answer to the challenges of development in the Mediterrean" was organised at Sciences-Po Paris to present the Mediterra 2016 in presence of Enrico Letta, Dean of the School of International Affairs of Sciences Po and former President of the Italian Council; Abdessalam Ould Ahmed, Deputy-director general and Regional representative of the FAO in the Near East and North Africa; Cosimo Lacirignola, Secretary General of the CIHEAM and Sébastien Abis, scientific and technical coordinator of Mediterra 2016. The 4th MED-Amin meeting (Mediterranean Agricultural Information Network) was held in Tunis, upon invitation of the Tunisian authorities, on the 7 and 8 December 2016. MED-Amin is a forum for discussion and the sharing of information aimed at providing decision-makers with improved transparency and a better understanding of cereal markets. The network contributes to the strengthening of multilateral dialogue in the Mediterranean and is therefore among the priority objectives of the CIHEAM Action Plan for the Mediterranean (CAPMED2025): Combating knowledge waste, improving food security, enhancing resilience against shocks, notably via the implementation of collaborative systems of crisis management. During this 4th MED-Amin meeting, it was decided to set up a working group to consider the establishment of a Mediterranean early warning system on wheat. Faced with the increasing constraints (climatic incidents, market instability, phytosanitary diseases, conflicts…) bringing together national operators, the CIHEAM, AMIS, and the European Commission, this device will allow for an improved flow of information, the implementation of concerted operations aimed at better preparedness and the sustainable management of the different shocks. At the invitation of the Albanian authorities, the 11th Ministerial meeting of the Ministers of Agriculture of Agriculture of the 13 member States of the CIHEAM took place in Tirana on the 22 September 2016. The meeting focused on the root causes of distress migration from the perspective of agricultural development and food security. The Tirana Declaration endorsed the CIHEAM Action Plan for the Mediterranean (CAPMED 2025) aimed at enhancing knowledge sharing in the region, better management of natural resources, improving sustainable agriculture and food and contributing to better inclusive development in the region. 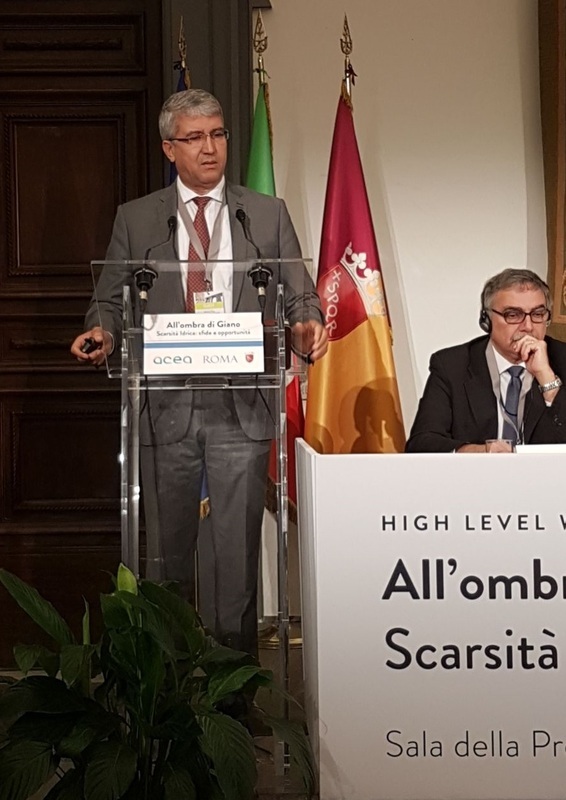 The FAO, the CIHEAM and the EBRD convened high-level policymakers, key players from private sector companies, co-operatives and producer organisations, governments, banks, academics and journalists to raise awareness and increase agricultural investment in the Mediterranean. Co-chaired by high-level representatives of the three Organisations, the Forum’s objective was to share good practices and elaborate policy messages on sustainable agrifood value chain development. The Forum focused on the Mediterranean region, with a particular attention given to Albania. The event fostered dialogue between public and private stakeholders while offering an exceptional opportunity to identify areas for investments in sustainable agricultural production and trade. Weak links between agribusiness and farmers, enabling policy and regulatory frameworks, efficient use of resources, and – generally – responsible agricultural investment practices were addressed.